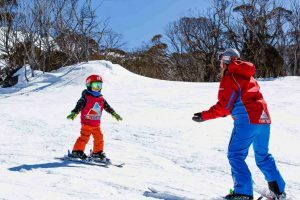 For the real little snow goers, aged 4 years and younger, who are not up to an all-day program or just want to give skiing a try, there is an “It’s all about ME” private lesson available. This is a one hour, one-on-one session, just your child and the specialised instructor, 100% attention. So if you are not sure your snow angel is quite ready for the all-day program or you just want to accelerate that first turn phase, then you should book the “It’s all about ME” private lesson. They happen daily on Friday Flat from 11.30am, bookings essential.